At the 2010 general election, only 16 per cent of ethnic minority voters supported the Conservatives. 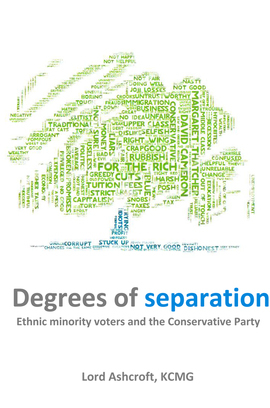 In Degrees of Separation Lord Ashcroft explores the gulf between ethnic and religious minorities and the Tories that is a well-known but little understood feature of British politics. Based on a unique 10,000-sample poll and extensive research among voters from black African, black Caribbean, Hindu, Muslim and Sikh backgrounds, Degrees of Separation sheds new light on one of the Conservative Partys biggest and most longstanding challenges.